Crowd cheers on during Art Pulaski’s speech. The townhall also featured speaker panels on state initiatives, with advocates providing information on a number of propositions including: Margaret Shelled a on Proposition 51, Hene Kelly on Proposition 55, Tom Rankin on Proposition 59, and Pauline Brooks on Proposition 61. 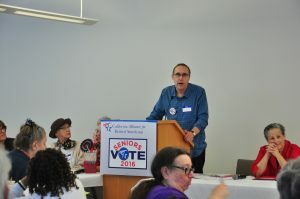 California Labor Federation’s former president and one of CARA’s vice presidents, Tom Rankin, spoke about Prop. 59, the measure to allow California elected officials to use their authority to work to overturn the Supreme Court decision in Citizen’s United v. Federal Election Commission, which gave corporations the right to spend unlimited amounts of money on elections. Rankin discussed the impact of the decision so far and how Proposition 59 could provide a path forward on campaign finance reform. Tom Rankin speaks to retired union members. Advocates in the room had several questions for the panelists on issues affecting their daily lives, particularly prescription drug costs and affordable housing. During his comments, Pulaski acknowledged Big Pharma’s influence on any attempt to reform and curb soaring prescription drug prices, particularly this year with SB 1010 (Hernandez) but he emphasized: “There’s an antidote to Big Pharma, and that’s you. That’s CARA”. 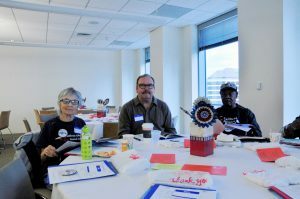 With housing, the crowd of retired union members raised personal concerns such as continuously rising housing costs, eviction, and their children and grandchildren having to move away from home in Alameda County. 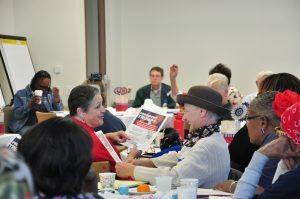 Senior advocates discuss taking action. After lunch, the candidate forum began with Sandre Swanson and Nancy Skinner, both candidates for for State Senate District 9, Bill Quirk, candidate for State Assembly District 20, Rob Bonta and Roseann Slonsky-Breault, both candidates for for State Assembly District 18, and Nate Miley, a candidate for Alameda County Supervisor of District 4. 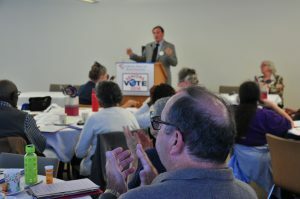 While CARA does not endorse candidates, the forum gave attendees a chance to hear from and engage with candidates who could be representing them post November 2016.